One person was transported to an area hospital after a two-alarm fire Thursday night. A fire broke out on West Hancock Street around 7:30 p.m. leaving 6 families without homes and multiple injured. Six families were left homeless and multiple people injured after a two-alarm fire in Manchester, New Hampshire. 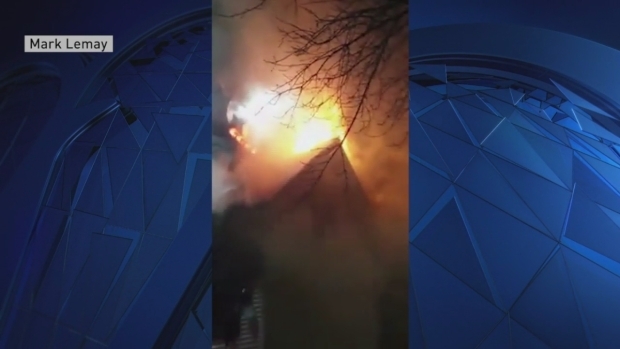 The Manchester Fire Department received multiple calls Thursday night for a fire in a multi-family dwelling with people trapped. According to the Manchester Fire Department, the fire started due to careless disposal of smoking materials in one of the apartments. The occupant of the apartment where the fire started was transported to the hospital with non-life-threatening injuries. A 2-alarm fire was reported in Manchester, New Hampshire Thursday night. Two firefighters sustained injures while fighting the blaze. One firefighter sustained superficial burns and a lieutenant suffered a shoulder injury. Neither were transported to the hospital as a result of their injuries. Most occupants evacuated themselves from the building. Firefighters led several to safety. While searching the flaming building, firefighters rescued several pets. Four dogs and one rabbit were removed from harm's way and reunited with their owners, says the Manchester Fire Department. The animals suffered from smoke inhalation but will survive. According to the fire department, the building's old “balloon-frame” style of construction allowed the fire to travel quickly up the walls and into a large, open attic space. Many families lost possessions in the fire. According to fire officials, the estimated damage due to the fire is $150,000. The Red Cross assisted the six displaced families with temporary housing and other needs.